Our architecturally designed house is located in a prime site, with uninterrupted views of Te Mata Peak and the Tuki Tuki river. Our property is private and peaceful and situated 10 minutes from Ocean Beach, 15 minutes from Waimarama, 5 minutes from Craggy Range Winery, 10 minutes from boutique shopping in Havelock North, 15 minutes from the international golf course and gannets at Clifton and 20 minutes from the art deco city of Napier. We are situated just above the venue for Black Barn weddings held along the banks of the Tuki Tuki River. Our property is in the same subdivision as the properties featured in The Bachelor Series 2017. The house was designed to capture the sun, and to make maximum use of uninterrupted views. The indoor/outdoor flow makes it perfect for couples or families. We have a communal astro-turf floodlit tennis court and a large swimming pool we put up in summer, which is perfect for cooling down in for adults and children alike. Our house is fantastic to soak up those beautiful evenings, as a base for walks, a place to unwind. If fishing is your thing, we are very close to the world renowned Tuki Tuki river. The house is large enough to accommodate 2 families if needed. The property has 4 bedrooms, which sleep 8. We can however put extra beds into an open plan area and/or into 3 of the bedrooms. The property can sleep 11 if it needs to, or more if people want to put tents on the lawn. We are prepared to occasionally do 1 or 2 night stays, but the cost will be more than the price listed. For HOY, we have a fully fenced, flat arena with water troughs where a number of horses can be kept. No extra cost for this. On arrival, all beds are made and towels are put up, to ensure for an easy stay. There are many basics in the pantry, which guests are free to use. Our aim is to make the experience memorable for guests. Suitable for 1 or 2 families. No smoking at all on property. I am a dietitian and wellbeing coach. My husband is a local GP. We are both originally from South Africa and have travelled the extensively to Europe, North America, Australia and around New Zealand. We have 3 children and love animals. We have lived in New Zealand for over 20 years and love the beautiful country and all that it has to offer. We have always loved the Tuki Tuki Valley, as it reminds us of areas in Natal - it is like a mini Drakensberg. The area is so tranquil and serene, yet it is close to everything one could wish for. The Tuki Tuki river is our favourite part of the view and the view changes depending on the time of day or year. The sunrises and sunsets are truly glorious. In the mornings, we often get purple shadows over the river as it snakes its way through the valley. Private and Tranquil with excellent indoor outdoor flow, excellent for relaxing or entertaining. The double glazing makes the house warm in winter and cool in summer. The view is truly amazing - it makes you feel like you can just take a deep breathe and let everything go. Whenever people come here, they stand at the window and marvel at the beauty of it. There are no traffic noises, only the sounds of birds in the morning and evening. We usually don't hear any neighbours sounds either. It is the most idyllic place to be. It is totally safe and very close to everything you could want. It is the best of both worlds. One bathroom has a shower. The other bathroom has a bath. The 2 toilets are totally separate. We are only a 10 minute drive to Ocean Beach. Ocean beach is a sandy ideal for swimming, boogie boarding or going for long walks. We are situated in a stunning location with views of the Tuki Tuki River and Te Mata Peak. Our property is situated in the same subdivision as the Black Barn property that featured on The Bachelor. 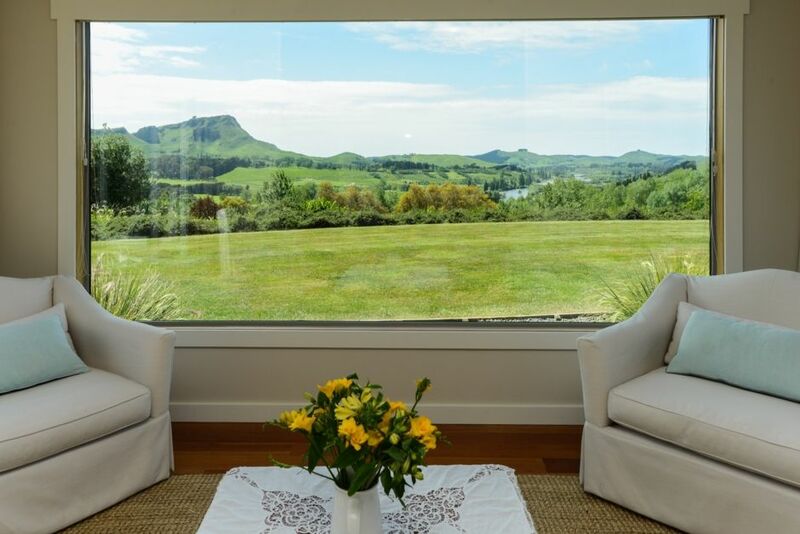 Stunning, uninterrupted view of the back of Te Mata Peak and surrounding hills. All the beds are made on arrival. Regular and beach towels are provided. Not a fitness room, but there is a tennis court on site. We have 2 dishwashers. 1 full and a dish drawer. The main fridge/freezer in the main kitchen is 100 percent for guests use. This has a double door. We have an induction stove top. All the basics are there for you to use - flour, sugar, spices, oils etc. You are free to use what you want. We just ask that guests replace if they use an excessive amount. Everything you need to entertain. We have a main kitchen and a separate scullery area with an additional dishwasher. Great for entertaining. The kitchen is open plan and leads onto the outdoor deck. We have access to sky tv, but you would need to bring your own card. This will be like home away from home. We treat our property with respect and ask our guests to do the same. It truly is a place to unwind, soak up the sun and views. This is an awesome place for a group of friends to spend a weekend, great indoor & out door entertainment areas, awesome location with a great view looking down the river. really enjoyed the tennis court also. only slight drawback was one shower but this worked out more than ok. thanks very much. Idyllic setting overlooking Te Mata Peak and Tuki Tuki River. Idyllic setting overlooking Te Mata Peak and Tuki Tuki River. Peaceful country setting. House is large, modern, warm and comfortable. Couldn't fault it for our group of 10 and wish we could have stayed longer. Diane and her husband own a spacious family home overlooking the beautiful Tukituki valley with majestic views to Te Mata Peak. Surrounded by this natural beauty their property is truly relaxing with comfortable both indoor and outdoor furniture. The kitchen and scullery are both really well equipped along with the nearby barbecue. With four double bedrooms our only criticism would be that there was only one shower in the two bathrooms which was a little challenging at times. This property is absolutely stunning! It's very clean, large and luxurious with gob-stoppingly gorgeous views of the Tuki Tuki River and Te Mata Peak. While it's a 10-15 minute drive out of Havelock North, there are plenty of things to keep kids happy (eg. lovely pool, trampoline, exercycle, board games, tennis court). We spent three nights there in January after our son's cricket camp and would love to return one day. Thank you for helping our family to create some lovely Hawkes Bay memories. House was so beautiful, great location and truly majestic. Simply beautiful property making the best of a special location. The property is situated on a farm park estate. It has uninterrupted views, peace and tranquility, yet is only 3 minutes to the closest cafe and 15 minutes to the centre of Havelock North. The drive to and from Havelock North takes you through the beautiful Tuki Tuki Valley. The farm park is so stunning, that one of the properties was used on the TV Series "The Bachelor". 5 minutes from us is Craggy Range Winery, which has a stunning location for enjoying a glass of wine or a meal. Only 10 minutes from us are Ocean Beach and a bit further is Waimarama Beach. Both are very popular in the summer months and used by families or individuals. Te Mata Peak is only a 15 minute drive away and has beautiful walks and tracks to explore and enjoy. From the top of Te Mata Peak you get a vista of the whole area and this is a must do. Maraetotara Falls is about a 10 minute drive and is a popular walk and swimming spot for families. You can jump off a rock into the falls. Napier is a 20 minute drive and is wonderful to explore to see the Art Deco architecture. There is a wide range of shopping, cafes and theatres to choose from. Havelock North is known for it's Boutique Shopping, and cafe culture. It is only a 15 minute drive from us. Elephant Hill is a a winery/restaurant set in a stunning location. It is on route to Clifton where you can go on a gannet safari to see the gannets. This is a great experience. You can either walk along the beach (you must check the tide times to ensure you can make it there and back) or you can go on a tractor (good fun). The walk up to the gannets is a steep climb, so wear comfortable shoes. Cape Kidnappers has an international golf course. You can also have beauty treatments done there. The tuki tuki river (just below our property) is known for fly fishing.